Get the Appearance Package on the Sport model, and it changes the RAV4's appearance quite dramatically, removing the spare tire hanging from the back and cleaning up the design. The 2012 Toyota RAV4 remains a strong, refined choice for families, even though some of its design might be a blast from the past. Of all the modern compact crossover models for 2012, the Toyota RAV4 remains one of the better picks its size for daily family-hauling needs. 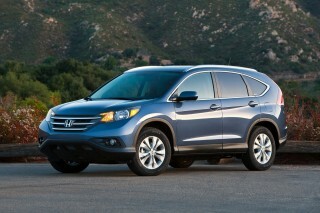 But looking at its conservative, traditional, faux-rugged SUV appearance, you might not expect that at all. That's because the RAV4's design is an odd conglomeration of what SUVs were and where they're going, in terms of both style and layout; the design—with the spare tire hanging on a side-opening hatch—seemed a little confused when this generation was first launched for 2006. 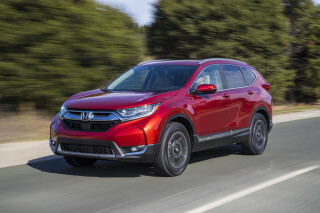 While the interior layout and roofline are along the same lines as those of fresh crossover designs, most of the RAV4 lineup also still bows to the most rugged SUV designs that were popular a decade or more ago—including that spare tire. Although the RAV4 doesn't seem modern in appearance, it's fully up to class rivals in performance. The base 179-horsepower, 2.5-liter four-cylinder engine is smooth, responsive, and has enough power to keep most drivers happy, while a 269-hp, 3.5-liter V-6 remains optional; as such, it has the ability to sprint with hot-rod-like authority or pull off astonishingly quick passes. All RAV4 models come with an automatic transmission—four-speed with the four-cylinder, five-speed with the V-6. In either case, the RAV4 is offered with either front- or four-wheel drive. The optional AWD system uses electronic control to send power rearward when slippage in front is detected, and offers a true 50/50 fixed power split with a 4WD Lock mode. 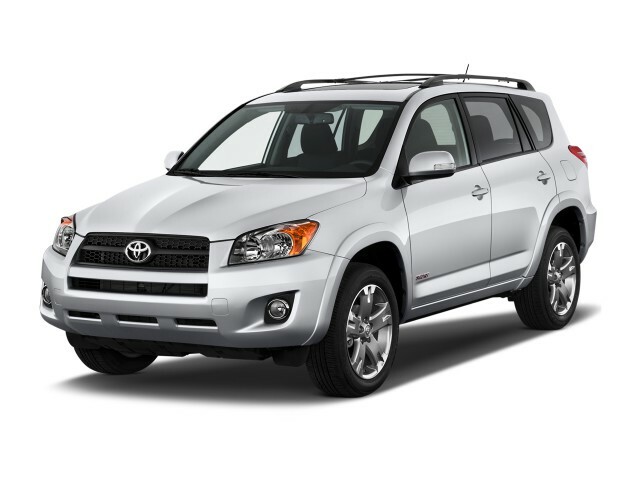 For such a tall, soft-riding vehicle, the 2012 Toyota RAV4 handles surprisingly well, yet its ride is by no means harsh. The interior of the 2010 Toyota RAV4 features an attractive two-tier instrument panel, good seats, a nice upright driving position, and plenty of storage spaces. The RAV4 teeters between compact and mid-size, but in any case, it's one of the few vehicles of its stature to offer a third-row seat. The third row officially expands the RAV4's capacity to seven, but you certainly won't have much luck trying to get adults to ride in the RAV4's third row. For that, you'll need to move up to the larger Highlander. But the seat design doesn't eat up much if any cargo space; when they're not occupied by children, they stow nicely in a recessed area of the cargo floor. Small third row seats and cheapish interior materials are about all there is not to like inside. Otherwise, well designed seating, good seating comfort, and top-notch assembly quality, along with a tight, quiet cabin, the RAV4 has covers all the bases. Three different trims of the 2012 Toyota RAV4 are offered—each with a choice of the four or V-6—so families are covered in seeking a RAV4 that's right, ranging from basic and fuel-efficient to luxurious or sporty and powerful. The base model includes a Lexus-like electroluminescent instrument panel, remote keyless entry, a tilt/telescoping steering wheel, power mirrors, three 12-volt outlets, ten cup holders, and cruise control. The top Limited model can be optioned like a luxury model, with leather seating areas, heated front seats, and the SUV-requisite rear seat DVD entertainment system to keep the kids entertained. 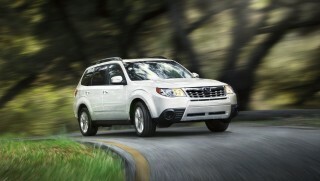 For 2012, sound systems have been completely revamped, and all models now include Bluetooth hands-free connectivity. With the new Display Audio systems, Bluetooth music streaming is also included, while in Limited models HD Radio with iTunes tagging, text-to-voice capability, and XM satellite radio are added. Also wrapped in is Toyota's Entune suite of services, with a range of data services and apps like Pandora streaming. If you choose the right model, you can do without the external spare; a Sport Appearance Package remains available, creating a more carlike silhouette by deleting it. Just that one change, combined with some other minor changes, make the RAV4 look much more like the crossover wagon it is. 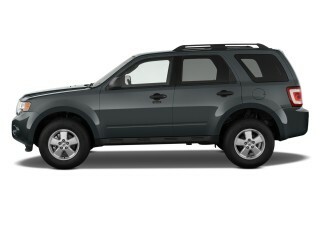 The 2012 Toyota RAV4 is a carlike crossover, dressed up to look a bit like a rugged SUV. The RAV4 was actually one of the first car-like crossovers, yet its design has held on to those early days and appears as an odd conglomeration of what SUVs were and where they're going. With the spare tire hanging on a side-opening hatch—a little confused even when this generation was first launched for 2006—the RAV4 looks like a throwback in some ways, thoroughly modern in others. Despite a modest redesign, a couple of years ago, which earned it a restyled grille and front bumper, improved fog light trims, and redesigned tail lights, the RAV4 kept its taller, more trucklike stance, as well as its side opening hatch and external spare--which seemed like an odd choice when this generation was launched in 2006. If you choose the right model, you can do without the external spare; a Sport Appearance Package remains available, creating a more carlike silhouette by deleting it. Just that one change, combined with some other minor changes, make the RAV4 look much more like the crossover wagon it is. The interior layout is along the same lines as those of fresh crossover designs, with more in common with the larger Highlander, but the interior details are among the most dated of any current Toyota vehicle. It has a very upright, straightforward layout, but the uninterrupted swaths of hard plastic and chunky, almost bulbous details that bridge a line between where Toyota's cars and trucks were--or, where they were six or seven years ago. The RAV4 is still one of the best-driving small crossovers, with perky powertrains and a responsive feel. Although the RAV4 doesn't seem modern in appearance, it's fully up to class rivals in performance. The base 179-horsepower, 2.5-liter four-cylinder engine is smooth, responsive, and has enough power to keep most drivers happy, while a 269-hp, 3.5-liter V-6 remains optional; as such, it has the ability to sprint with hot-rod-like authority or pull off astonishingly quick passes. All RAV4 models come with an automatic transmission—four-speed with the four-cylinder, five-speed with the V-6. In either case, the RAV4 is offered with either front- or four-wheel drive. A manual gearbox is no longer available in any of the models. The optional AWD system uses electronic control to send power rearward when slippage in front is detected, and offers a true 50/50 fixed power split with a 4WD Lock mode. Though off-road ability isn't a priority in the RAV4, its four-wheel-drive system is a bit more able than rival crossovers, capable of sending as much as 45 percent of torque to the back at up to 25 mph and including a 50/50 fixed power split in a 4WD Lock model--good for deep snow, or muddy two-tracks. For such a tall, soft-riding vehicle, the 2012 Toyota RAV4 handles surprisingly well, yet its ride is by no means harsh; Sport models fix its tendency to plow hard into corners, but they give up some ride quality. The RAV4 has a well-designed interior, although the third-row seat isn't quite adult-sized. The RAV4 teeters between compact and mid-size, but in any case, it's one of the few vehicles of its stature to offer a third-row seat. And with well designed seating, good seating comfort, and top-notch assembly quality, along with a tight, quiet cabin, the RAV4 has covers all the bases. Some subpar interior materials remain our only significant gripes. Front-seat comfort is good in the RAV4 for most drivers, although taller drivers will find the lower cushions a little short and lacking support. The second row is comfortable enough for adults, and folds forward neatly as well as reclines. Cargo space in the RAV4 is quite impressive, with extra storage wells in the rear floor and a third row that folds completely flat. The side-opening rear door and rather tall cargo floor are features that family shoppers might not find as friendly as top-opening hatches. The third row officially expands the RAV4's capacity to seven, but you certainly won't have much luck trying to get adults to ride in the RAV4's third row. For that, you'll need to move up to the larger Highlander. But the seat design doesn't eat up much if any cargo space; when they're not occupied by children, they stow nicely in a recessed area of the cargo floor. Small third row seats and cheapish interior materials are about all there is not to like inside. Otherwise, well designed seating, good seating comfort, and top-notch assembly quality, along with a tight, quiet cabin, the RAV4 has covers all the bases. Sport models with the larger 18-inch wheels tend to ride a little harder and more vocally. Overall, the RAV4 rides well, without much road or wind noise. 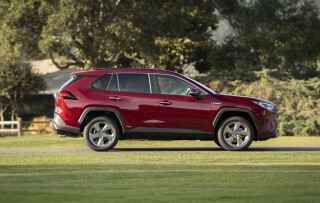 Some lackluster safety ratings mean the 2012 RAV4 is near the back of the safety pack. While the 2012 Toyota RAV4 has a great set of safety features, its crash-test results have been lackluster. In Insurance Institute for Highway Safety (IIHS) tests, the 2012 Toyota RAV4 earns top 'good' scores in all categories except roof strength, where it earns just 'acceptable.' And that keeps it from earning IIHS Top Safety Pick Status. In the federal government's NCAP tests, the RAV4 has only achieved three-star frontal protection, and a four-star side rating, for an overall rating of three stars. We're referring to 2011 ratings, which the feds still hadn't officially carried them over for 2012 at the time of writing (the RAV4 is structurally and cosmetically unchanged). Driver and front passenger front-seat-mounted side airbags and first- and second-row roll-sensing side airbags are included in all RAV4s, along with electronic stability control and anti-lock brakes. All-wheel drive, stability and traction control, and electric power steering come together in Toyota's VSC system. Models equipped with the third-row seat also come standard with Hill-start Assist Control (HAC) and Downhill Assist Control (DAC)—two features that are derived from what Toyota offers in its off-road-worthy vehicles and would come in quite handy for negotiating a steep, snowy driveway. The feature list offers plenty for families on a budget. The 2012 Toyota RAV4 is offered in three different trims—each with a choice of the four or V-6—so families are covered in seeking whichever model best meets their needs, ranging from basic and fuel-efficient to luxurious or sporty and powerful. The base model includes a Lexus-like electroluminescent instrument panel, remote keyless entry, a tilt/telescoping steering wheel, power mirrors, three 12-volt outlets, ten cup holders, and cruise control. On the other hand, the top Limited model can be optioned like a luxury model, with leather seating areas, heated front seats, and the SUV-requisite rear seat DVD entertainment system to keep the kids entertained. 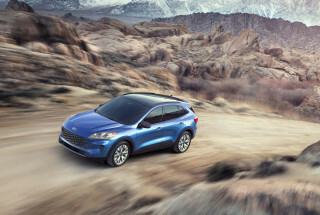 Hill Assist Control (HAC) and Downhill Assist Control (DAC)—useful driving aids on- or off-road at low speed—are standard on V-6 models and four-cylinder models with the optional third-row seat. And on V-6 models, towing capacity can be increased to 3,500 pounds. 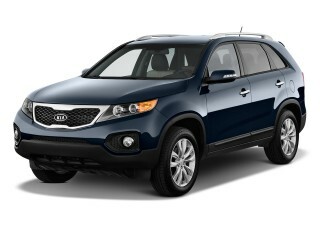 The 2012 Toyota RAV4 is relatively fuel-efficient, but it's not much greener than the larger Highlander. The 2012 Toyota RAV4 is a reasonably fuel-efficient pick, with EPA ratings as good as 22 mpg city, 28 highway with the four-cylinder engine. On the other hand, if you choose the V-6, and opt for four-wheel drive, ratings drop to 19/26. If you take full advantage of all the RAV4's interior space and its three rows of seating, that still makes it a very efficient vehicle. 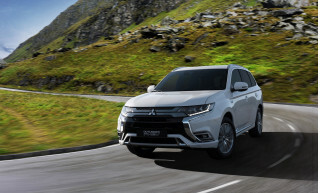 But what's particularly surprising is that the Highlander isn't much more fuel-efficient than the larger Highlander--and you could actually do quite a bit better in choosing the Highlander Hybrid.